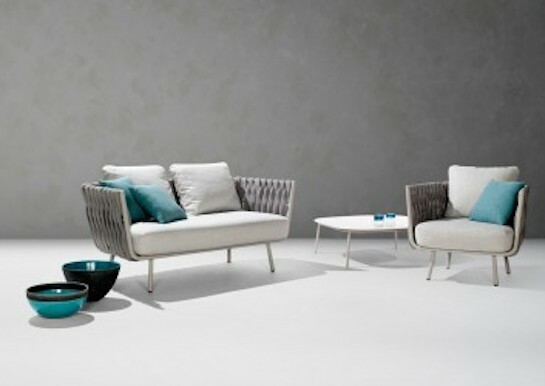 The Tosca outdoor sofa is simultaneously warm and inviting, stylish and intriguing. It was the first time TRIBÙ called upon a female designer to draw an outdoor furniture piece and that is noticeable in the design. Rounded forms, tapered legs and an elegant seating shell in powder coated stainless steel, upholstered with extra-wide braiding. The material for the braiding is genuinely innovative; foam mousse is encased in a seamless sheath of knitted textilene and polyolefine which makes the material weather-resistant, but also surprisingly soft to the touch. This collection is as comfy as it looks, and the soft linen and wenge colours emphasize the chic character of this luxurious outdoor sofa.